How and Where to Buy Breo Ellipta Online? 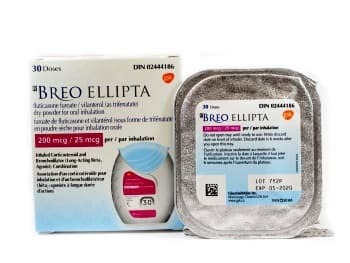 You can buy Breo Ellipta through CanadianPharmacyWorld.com at a very reasonable price. We do require a valid prescription from your doctor. Our International Pharmacy offers brand and generic RX and OTC medications online. Canadian Pharmacy World is a certified member of The Canadian International Pharmacy Association (CIPA). Are there Alternative Names for the Brand and Generic Breo Ellipta? The Breo Ellipta Inhaler also called Relvar Ellipta comes from UK and is manufactured by GSK. We also carry the brand Breo Ellipta from Canada manufactured by GSK. The generic is not available for this medication. You may also purchase other Asthma Medications. What Dosages and Forms is Breo Ellipta available in? Breo Ellipta is available in the strength of 92mcg/22mcg/30dose equal to (100mcg/25mcg/30dose), 100mcg/25mcg/30dose and 184mcg/22mcg/30dose inhalers. Breo Ellipta (Fluticasone furoate/Vilanterol Trifenatate) inhaler is a prescription medication that is a once-daily combination medication that used in adults with asthma or COPD to improve symptoms and to prevent bronchospasm or asthma attacks. This inhaler contains 2 medications Fluticasone and Vilanterol. This medication works by opening airways to the lungs to make it easier to breathe. Breo Ellipta inhaler must be used regularly to be effective. Are there any Precautions or Drug Interactions for Breo Ellipta? You should not use Breo Ellipta inhaler if you are allergic to Fluticasone or Vilanterol Trifenatate. Before you start using this medication, talk to your doctor about your medical history and about all the medications you take including OTC and herbal medications. You should not use this medication if you are already having an asthma attack with sudden shortness of breath or wheezing. Breo Ellipta may slow down a child’s growth if used for a long time. This medication should not be used only when clearly needed. It is unknown if this medication passes into breast milk. The different brand of this medication has different storage needs. All medications should be kept away from children.